This week it seems at least half the bloggers in my Feedly have been playing a new game. Some of them seem to be having a great time while others aren't completely convinced. And someone I expected to be all over it hasn't even started yet. I've been playing a new game too. One other person in this quadrant of the blogosphere took the same road less trampled and of course it was Kaozz. Her first impressions piece appeared just after I'd finished my opening session in Riders of Icarus. That was probably just as well because I had been going to put up one of my own but at that stage I hadn't even finished the tutorial. Since then I've played this newest Eastern import several more times and from the dizzy heights of level 6 I'm ready to agree with Kaozz that it's "a solid game that looks good." Well, almost. Who has the longer neck? Let's start at the beginning: character creation. You can be a human or...no, you can be a human. I chose to be a female for a change (stop laughing at the back) but it was a struggle getting anything I imagined I'd be happy to see looking back at me from screenshots. There are a lot of sliders and styles but the character models are iffy. The proportions seem slightly off, particularly the necks, which all seem to be uncomfortably extended. After a few hours play I still don't feel comfortable with the character I made, which is a strong indicator that I won't be playing long. In common with most MMOs the default graphic settings appear to be intended for someone who hasn't bought a new PC since the Bush administration. Possibly the first one. I don't know why they do this. First impressions count for an awful lot so why you'd want people to log in for the first time to the wrong screen resolution and a lot of low textures is a puzzle. I died twice getting this wolf because he kept throwing me off into the rest of his pack. Things improved rapidly with a few tweaks. It runs on CryEngine 3 but the art design could be from almost any of the dozen or more Korean MMOs I've played over the last few years. Everything is over-scaled and there's an oddly flat quality that seems to leech out depth of field somehow. It's certainly pretty enough to make looking at the world a pleasure and I found no shortage of screenshot opportunities. My first and so far only character is a Berserker, flagged as the "Easy" option. She hits things with a sword that is, predictably, bigger than she is. The controls are peculiar. The developers get a huge thumbs up from me for offering a choice between tab-target and hotbars or action settings but the traditional version, which naturally was my choice, is awkward to use. Like Dragomon Hunter, you can click the icons on your hotbar with the mouse pointer, as I prefer to do, but you either have to double-click or right-click. Why we can't have the basic single click that MMOs have used for the best part of two decades beats me. The fiery hawk is a freebie for playing the Open Beta. The thigh-high stiletto-heeled leather boots are not optional. Or practical. Or comfortable, I'd imagine. Bag space is reasonable. I got an additional bag for a quest around level 5 and it just goes into a slot like it would in WoW or GW2. None of this incrementing the base inventory count by two like Black Desert. Once you're in there's a short "Escape from Prison" tutorial straight from the "Build Your Own MMO" manual but after you're largely left to get on with things on your own, with further instructions being incorporated into the basic leveling quests. Progress seems to be linear in the extreme, down to the way maps funnel you in a particular direction, so the chances of you wandering off piste are minimal. What with only one race that's seriously going to limit replayability but that's the nature of these true F2P imports, by and large. I did laugh out loud at the Kangaroo. It's as amusing to ride as you'd imagine, too. The translations are excellent. I haven't come across any untranslated text or Korean voiceover yet and there are no more grammatical or spelling errors than in a Western MMO in beta. 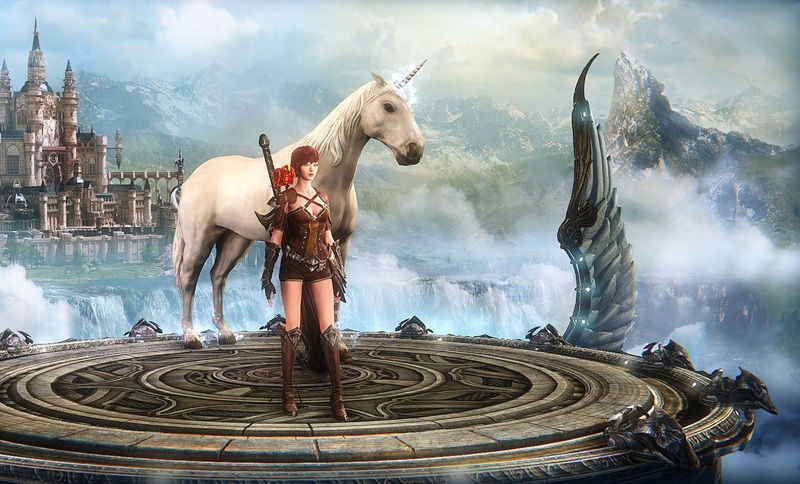 Did I mention Riders of Icarus is in "Open Beta"? No wipe so we'll call that "Soft Launch" I think. The writing is adequate but not much more than that. Unlike Dragomon Hunter, whose often bizarre and surreal dialog occasionally has me laughing out loud, this is quite dry. The quests themselves are cookie cutter and plain cookies at that. They all work though and they are short and tidy. Quality control seems high. The real meat comes with the gameplay. 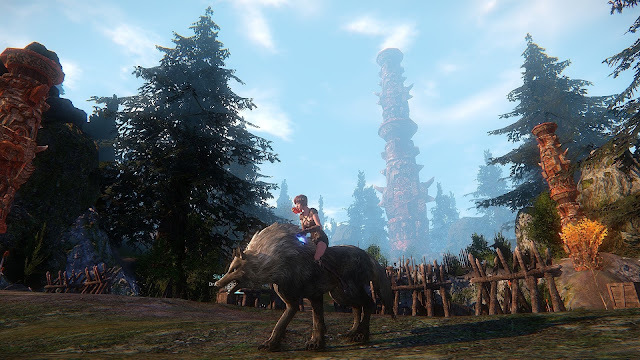 Riders of Icarus offers two things most MMOs don't - a huge range of tameable pets and mounts and mounted combat. I haven't yet tried the latter but the "gotta catch 'em all" aspect has considerable appeal. Wonder where they got the idea from? The NPC and monster models are variable. This is the Queen of the local fairies and she looks the part. It took me several tries to tame my initial mount, a Unicorn. You have to sneak up to it using the taming skill and then hit Space to literally jump onto the creature's back. The first couple of times I missed altogether. 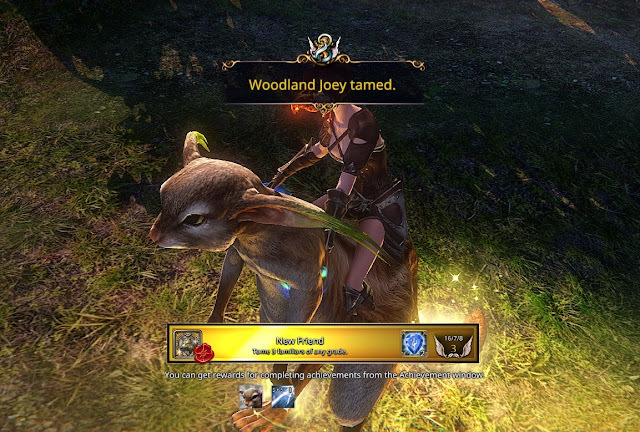 When I did get onboard the Unicorn bucked me off but I got back on and just sat there and somehow I ended up with a docile mount. There is actually more to it than that. Not much more, I'll grant you, but you do have to do something. There are various messages describing how the animal is reacting and these correspond to four keys, bound by default to WASD. Don't worry about interpreting which emotional state matches which action - the key you need lights up. Just press that one. So far I have the Unicorn, some kind of Wolf, a Turtle and a Kangaroo. In fact I have two Kangaroos. 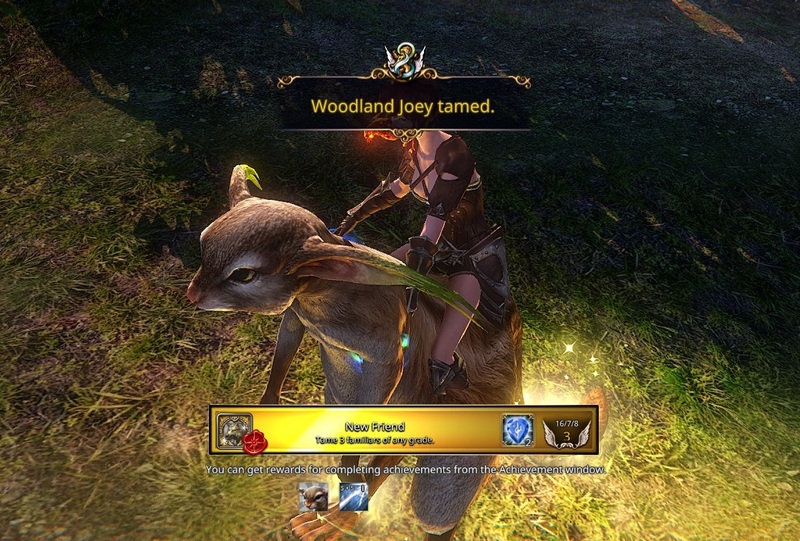 Apparently you can tame multiples of the same creature, which is useful because tamed animals can be either Mounts or Pets but not both. When tamed they are automatically set as Mounts and the process of converting a Mount to a Pet is permanent, so you want spares. Loading screen with the obligatory "tip". I wasn't aware there were "talent builds". I took the shot because the rabbit in the bottom left corner, who lets you know the zone is still loading, is the most appealing character in the whole enterprise. I wish I was playing whatever game he comes from. As Kaozz mentions, there's an annoying stamina bar mechanic for both mounts and pets. As soon as the bar depletes your animal vanishes and you fall off (assuming it was a mount). The bar refills quite fast but it's annoyingly disruptive. I'm guessing you can buy something in the cash shop to circumvent the problem but I haven't bothered to check since there is no chance in this lifetime of me spending a cent on the game. Weirdly, I seem to have found myself with a choice of "collect all the pets" games and neither of them is the one everyone else is playing. I prefer Dragomon Hunter by several country miles - it's quirky, funny and has a lot of personality. 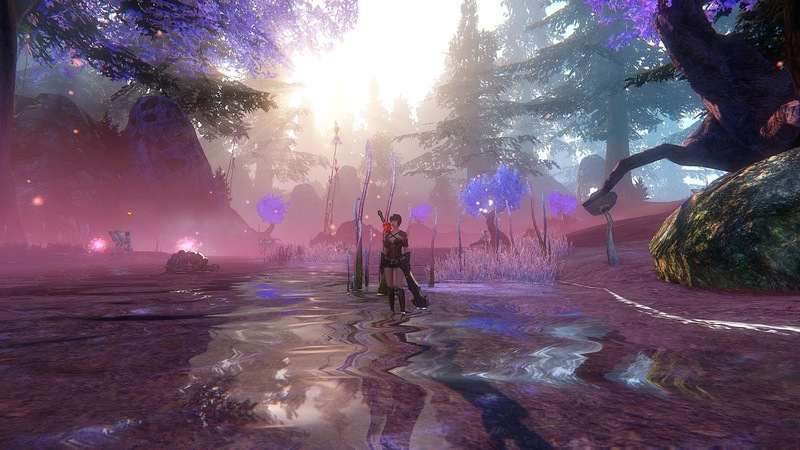 Riders of Icarus is flashier and takes itself more seriously but feels a lot more corporate and bland. Most importantly, though, I actively like my DH character whereas my RoI avatar is a cipher. That could change over time but I don't expect to be playing long enough to find out. Riders of Icarus is by no means a bad game or a bad MMO but with so many others to choose from I'd struggle to come up with a good reason to play it rather than something with a bit more soul.